Although the textbook definition of a fake, given above, is unequivocal, in practical terms the determination of what is a fake can be difficult. Three less-than-straight-forward examples are given in this file. In different ways they suggest how careful the buyer must be if he or she is not to be deceived. Because of its popularity, today’s “restoration” of damaged glass must also be considered. Usually no deception is intended. However, on occasion a piece of genuine glass will be altered (or repaired) “for the purpose of deceptively enhancing its value.” This thorny subject is considered in the Restoration of Damaged Glass file. 1. Replacing a missing stopper. Is this an act of deception? Some would say that it is. Others would suggest that while a fake has been created, it is an acceptable fake if — and only if — the seller informs the buyer that the stopper is a replacement. 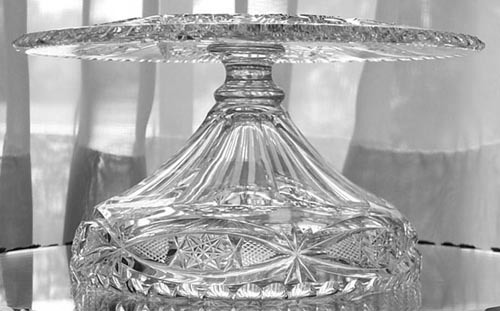 A case in point: In REFLECTIONS ON AMERICAN BRILLIANT CUT GLASS by Bill and Louise Boggess (1995, p. 180) there is a photograph of a footed and handled decanter, red cut-to-clear in the Russian-Cleveland (Star and Hobnail) pattern. It was purchased stopperless by this writer (JMH) in 1984. At that time he had only one spare stopper; it was colorless and faceted. Fortunately it also had an unusually long neck, and its plug was slightly larger than the decanter’s neck. In other words it was a prime candidate to be used as a replacement. And this was done. With the newly fitted stopper — and the story of its origin — the decanter quickly sold for $650. Later it appeared in the Boggess book with the implication that it is 100% original. Because this is not true, a genuine piece of American brilliant period cut glass has been turned into a fake. Fortunately, the buyer has the option of removing the stopper and converting the fake back into a genuine (if stopperless) nineteenth century cut-to-clear decanter. The first item reproduced here was posted for sale at the eBay auction site, and the winning bid was $1675 (18 Jun 2000). It was described as a “Rare cut glass toupee stand!!! Signed Libbey.” As they say — thereupon hangs a tale. This item, or its duplicate, was first shown in Pearson 1969 (p. 145) where it is described as a “toupee stand.” Its dimensions, 6.4″ by 3.2″, are identical to those given in the eBay posting. The Pearsons make no mention of a Libbey signature, however. Thus began “toupee stand fever.” In the years that followed, this item (or its twin) made appearances at major auctions where it consistently brought high prices. If not a “toupee stand,” then what is the item under discussion? In the opinion of this writer it is nothing more than a bowl permanently attached to an underplate. This interpretation is clearly seen by rotating the above image 180 degrees or flipping it vertically (Image: Internet). The reader can easily see the flat central area of the underplate that rests on a table top, and the plate’s slightly sloping underside which makes it easy to lift the bowl/plate off the table. And the incurved profile of the bowl should be noted as well. It would be helpful to discover the blank used by Libbey, but so far it has escaped identification. 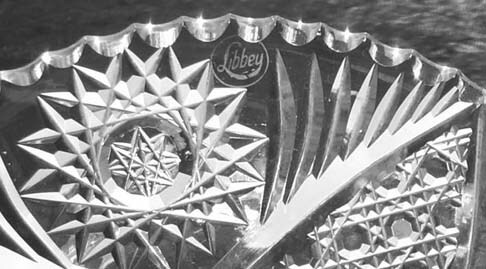 When the Boggesses showed the Libbey example (or its twin) in IDENTIFYING AMERICAN BRILLIANT CUT GLASS (Third edition, p. 38), they equivocated concerning its purpose. They mention the possibility that it is “a mayonnaise …, but this would make the Libbey signature upside down.” The image above shows the Libbey signature with the item in its “toupee position” (Image: Internet). The acid-etched signature has been stamped on the “cut” side of the underplate. Up-ending the item to its “mayonnaise position” results in the signature being reversed when the underplate is viewed from its uncut side. (The signature has not been turned “upside down,” an expression that is meaningless in this context.) It presumably was more convenient to apply the acid stamp to the underplate’s cut side rather than to its uncut side. While it is unusual to have an item stamped in this manner, it is not unheard of. In any case the placement of the signature is unlikely to be related to the purpose of the item; therefore, this evidence is irrelevant. Similarly, the argument that the cut surface would not be designed to be placed directly onto a table top’s surface — as would occur if the item were used as a mayonnaise — is contradicted by the heavily cut celery trays, relish dishes, and the like that were in use at this time. No harm would have been done to the table top if the hostess took elementary precautions! It is not known if the Pearsons were serious, more than thirty years ago, when they described this item as a “toupee stand.” It could have been a playful sense of humor. Regardless, in this situation it is not necessary for the seller to alter, or add to, an original item in order to produce a fake. He only needs to photograph it upside down! This fakery also applies to another one-piece bowl-and-underplate combination, one that was cut by T. G. Hawkes & Company. This item, identified as a “toupee stand,” is shown, but not discussed, in Spillman 1996 (p. 155). Both the Libbey and the Hawkes items were probably made about 1908-1915. Although it is discouraging to find “toupee stands” advertised for sale, it is a comfort — but only a small one — to note that the auction prices paid for the Libbey fakes have decreasedover the years: from $3000 in 1990 to $1800 in 1998 to $1675 in 2000 to $1056 in Feb 2002, when an additional “stand,” offered by an ACGA dealer, failed to sell at just under $900. The most recent price is still excessive, however. One-piece mayonnaise sets should probably sell in the $200 to $500 range, depending upon the maker and the cut-glass pattern used. However, the writer does not recall seeing many heavily-cut one-piece mayonnaises; apparently they have all been turned into “toupee stands”! 3. Putting an authentic blank to good use. During the fall of 1984 the writer came across a set of what can be called “semi-blanks” at a consignment shop in Barrington, RI. Standing about 4.25″ (11 cm) tall, and having a capacity of about 2 oz, the glasses were probably intended for cocktails; the flaring shape of the bowl suggests this use. As can be seen in the image on the left, below, the stems were flute (panel) cut and notched and the basal knop faceted. The feet carried 20-pt hobstars with clear (uncut) hobnails. Only the bowls were uncut. About this time the possibility of present-day glass cutters replicating the intricate patterns of the American brilliant period was a topic that was widely discussed. To show that well-trained modern cutters are, indeed, able to do this work the writer asked a cut-glass repairman (restorer) to cut the bowls of several of the semi-blanks in what was, and remains, a favorite pattern of the writer’s, Hawkes’ Grecian. 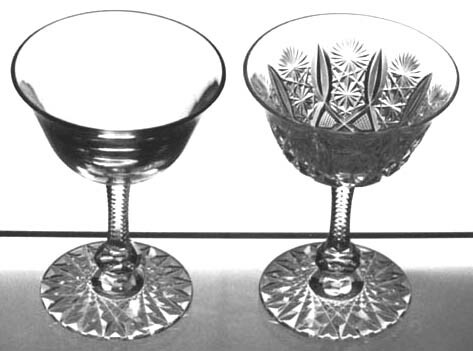 A photograph of a set of stemware in this pattern that is shown in Wiener and Lipkowitz (1975, p. 202) was used as a model. It was necessary for the cutter to draw a rough representation of the pattern on each glass free-hand, but he was able to simplify his drawings and speed up the process as he became accustomed to cutting this pattern. The cutting of the bowls removed significant amounts of glass. As a result the glasses, which were noticeably top-heavy prior to being cut, acquired improved balance after being cut. It was possible to match the polish because the originals were originally hand-polished (no acid). We will never know why these glasses were never completed. The glass metal is of excellent quality and care had been taken with the cutting of the stems and feet. The maker of the original glasses remains unknown as well, but as our knowledge of the origin of blanks increases it may eventually be possible to identify the glasshouse responsible. Barrington, RI, incidentally, is not far from New Bedford, MA (Mt. Washington/Pairpoint). The writer took care that he sold these glasses only to collectors who appreciate the skill of the present-day glass cutter; therefore, none are likely to appear on the open market. But if such a glass were to be re-sold — and its history not conveyed to the buyer — then the glass would be a fake. If, however, its history were told to the buyer, then the glass would be classified as a reproduction. Chervenka, Mark, 1994: How acid marks are forged, Antique & Collectors Reproduction News, Vol. 3, No. 10, pp. 6-7; and Marks on cut glass, same issue, pp. 8-12 (Oct 1994). Chervenka, Mark, 1997: Avoiding new cut glass, Antique & Collectors Reproduction News, Vol. 6, No. 2, pp. 1, 14-19, 24 (Feb 1997).